GAAFOUR, Tunisia (Reuters) - On Wednesday, Saif Rezgui sat down with friends in his Tunisian hometown to chat about his favourite football team, girls and his breakdance skills over coffee and cigarettes. On Thursday, he met up with his uncle in Gaafour, catching up on family matters, on a break from his master’s studies in the nearby historic town of Kairouan. 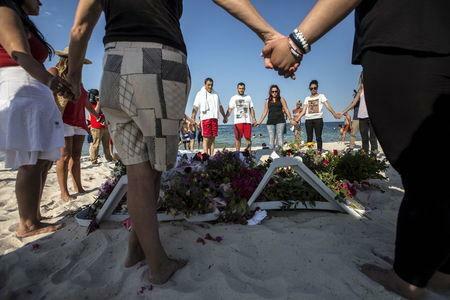 A day later, Resgui walked calmly though the Imperial Marhaba beach hotel on Tunisia’s Mediterrenean coast opening fire with a Kalashnikov, and in more than five minutes slaughtered 39 foreign tourists in the name of Islamic State. Once again, Tunisia is in shock over how one of its young men with little warning turned from what appeared to be a normal life to hardline violent ideology of Islamic jihad. Again, a well-educated Tunisian from a middle class family appears in a short time to have fallen prey to radical recruiters who turned him away from a life of football and music to become a militant Islamist. In Gaafour, an isolated farming town on the arid plains southwest of Tunis, neighbors and family struggle to piece together how a neighbourhood favourite and son became a killer responsible for the country's worst militant attack. Authorities and witnesses say Rezgui was the only gunman who opened fire on the beach of the Imperial Marhaba, working his way through the pool, and hotel reception picking out foreigners, before he was shot himself by police. Just as with the two young Tunisians who attacked the Bardo museum in Tunis in March, killing 21 people, Saif gave little hint to family and friends of his new radical beliefs. If anything he revealed nothing at all. A fan of breakdance, rap music and most of all Club Africa, Tunisia's league champions, Rezqui worked part time in the small Ben Hassan café in Gaafour serving coffee and cigarettes. "Who could imagine he would commit such a horror?" Ali Rezgui, his uncle, told Reuters, slumped in a plastic chair outside the modest one-story white house where the family gathered to mourn. "Maybe he was changed where he studied, maybe it was something on the internet. But we just don't have any answers." Like many rural Tunisian towns, there is little opportunity for the youth of Gaafour, a dusty collection of low buildings amid the wheatfields and scattered olive trees. But neighbours and friends remember Rezgui as a cheerful chatty young man who prayed regularly, but never talked about religion. He was studying away but was often back home. Last Wednesday, he met with four or five friends in a café to catch up after returning from his studies in Kairoaun. They talked about football even singing team chants. "He didn’t show any signs of extremism or anything. He never talked about religion," said Mohammed, a friend. "It's a shock to see someone who you spend so much time with, a friend, become a killer." Whatever his motivation, Rezgui had taken a well-travelled path. Middle class Tunisians, from footballers to professionals and students have left from similar towns across the country to fight for Islamist militant groups overseas. The government estimates more than 3,000 Tunisians are fighting for Islamic State and other groups in Syria, Iraq and increasingly in neighbouring Libya. Threats from Islamist militants is becoming the greatest challenge to Tunisia since it emerged to democracy following its 2011 uprising against autocrat Zine El-Abidine Ben Ali. Democracy brought a new constitution and free elections, but the end of Ben Ali's supression allowed ultra-conservative Islamist movements to flourish. Some turned violent; others took over mosques and religious schools to spread a hardline message in one of the Arab world's most secular countries. The Bardo killers -- one from a similar rural town as Gaafour; the other from Tunis -- were both recruited by hardline preachers at their mosques. Both spent time in Libya at training camps before their attack. How Rezgui fits into this current is still unclear. There was little clue at all he had been recruited. Gaafour’s mosque is not linked to any ultraconservative Islamists. He was studying in Kairouan which, with its famous Great Mosque, after the 2011 revolution become a hub for hardline Islamist groups such as Ansar al-Sharia. But authorities say Rezgui was not on any terrorism watchlist or known to associate with hardline Islamists. He was not known to police as a suspect. Security sources said he appeared to have been radicalized just over the last six months. "He was in contact with extremists outside of Tunisia, through the internet," one security source said. Forensic evidence shows that all the bullets at the beach resort massacre were fired from the Kalashnikov Rezgui used in the attack, indicating he was the only attacker, the source said. Rezgui may have acted alone as a so-called "Lone Wolf" jihadist more inspired by Islamic State's jihadist message than associated directly with the militan group. But he kept his secret life well-hidden. "It's hard to believe. I really can't comprehend it," said Ahmed, who danced in a breakdance group with Rezgui. "When I saw his image with the Kalashnikov, I just keep thinking of how we had just been together."